This page will walk through Spring Boot CrudRepository example. Spring Boot Data enables JPA repository support by default. CrudRepository provides generic CRUD operation on a repository for a specific type. CrudRepository is a Spring data interface and to use it we need to create our interface by extending CrudRepository. Spring provides CrudRepository implementation class automatically at runtime. It contains methods such as save, findById, delete, count etc. Spring boot automatically detects our repository if the package of that repository interface is the same or sub-package of the class annotated with @SpringBootApplication. Spring Boot provides default database configurations when it scans Spring Data JPA in classpath. Spring boot uses spring-boot-starter-data-jpa starter to configure spring JPA. For data source we need to configure data source properties starting with spring.datasource. * in application.properties. In Spring Boot 2.0 release, default database pooling technology has been switched from Tomcat Pool to HikariCP. Spring boot prefers HikariCP on first place then Tomcat pooling and then Commons DBCP2 on the basis of availability. Here on this page we will create a Spring Boot Rest web Service for CRUD operation. CRUD operation will be performed by CrudRepository. Now find the complete example step by step. Find the pom.xml used in our example. CrudRepository is an interface and extends Spring data Repository interface. CrudRepository provides generic CRUD operation on a repository for a specific type. It has generic methods for CRUD operation. To use CrudRepository we have to create our interface and extend CrudRepository. We need not to implement our interface, its implementation will be created automatically at runtime. Find some of CrudRepository methods. <S extends T> S save(S entity): Saves and updates the current entity and returns that entity. Optional<T> findById(ID primaryKey): Returns the entity for the given id. Iterable<T> findAll(): Returns all entities. long count(): Returns the count. void delete(T entity): Deletes the given entity. boolean existsById(ID primaryKey): Checks if the entity for the given id exists or not. CrudRepository has subinterface as PagingAndSortingRepository that provide additional methods to retrieve entities using the pagination and sorting abstraction. Spring boot enables JPA repository support by default. To use CrudRepository in our Spring data application we need to create an interface implementing CrudRepository and then all is done to use it. Let us discuss step wise how to use CrudRepository in our Spring data application. In our example we will perform CRUD operations on article data for demo. So I will create an interface for article extending CrudRepository as following. We need not to create its implementation class. Spring will automatically create its implementation class at runtime. Spring boot can automatically detect our repository if the package of that interface is the same or sub-package of the class annotated with @SpringBootApplication and if not then we need to use @EnableJpaRepositories annotation with @SpringBootApplication. Let us understand by example. Suppose we have a class annotated with @SpringBootApplication in the package com.concretepage as given below. Now if we have a repository ArticleRepository and it resides in package com.concretepage or its sub-packages such as com.concretepage.repository then Spring boot will automatically detect our repository and so no need to use @EnableJpaRepositories annotation. If we choose a package for our repository that is neither same package nor sub-package of the package of the class annotated with @SpringBootApplication, then Spring boot will not be able to detect repository classes by default. In this case we need to use @EnableJpaRepositories annotation with @SpringBootApplication. Using @EnableJpaRepositories we will configure package name in which our repository classes reside. Suppose the package of our repository classes is com.cp.repository, we will use @EnableJpaRepositories as following. If we want to configure specific classes then we need to use basePackageClasses attribute of the @EnableJpaRepositories annotation. Suppose we have a class ArticleRepository in the package com.cp.repository, then we can configure repository using basePackageClasses as following. To instantiate our ArticleRepository that has extended CrudRepository, we can use dependency injection. Now we are ready to use methods of CrudRepository. Find the example for some of its methods. CrudRepository provides methods for generic CRUD operation and if we want to add custom methods in our interface that has extended CrudRepository, we can add in following ways. a. We can start our query method names with find...By, read...By, query...By, count...By, and get...By. Before By we can add expression such as Distinct . After By we need to add property names of our entity. b. To get data on the basis of more than one property we can concatenate property names using And and Or while creating method names. c. If we want to use completely custom name for our method, we can use @Query annotation to write query. Find the code snippet that is using the sample method name for the above scenarios. The implementation class of the above methods will be created by Spring at runtime automatically. CRUD methods of CrudRepository are transactional by default. They are annotated with @Transactional annotation with default settings in implementation class at runtime. For reading operation readOnly flag is set to true. To override default transactional settings of any CrudRepository methods we need to override that method in our interface and annotate with @Transactional using required configurations. Find the example. Here we have configured timeout as 8 seconds to execute query without readOnly flag for findAll() method. Datasource, JPA properties and logging etc need to be configured in application.properties file located in the classpath of Spring boot application. These properties will automatically be read by Spring boot. In Spring Boot 2.0 release, default database pooling technology has been switched from Tomcat Pool to HikariCP. spring-boot-starter-jdbc and spring-boot-starter-data-jpa resolve HikariCP dependency by default and spring.datasource.type property has HikariDataSource as default value. The datasource properties starting with spring.datasource. * will automatically be read by Spring boot JPA. To change the Hibernate properties we will use prefix spring.jpa.properties. * with Hibernate property name. On the basis of given data source URL, Spring boot can automatically identify data source driver class. So we need not to configure diver class. Find the properties to configure JpaBaseConfiguration and HibernateJpaAutoConfiguration in application.properties. spring.data.jpa.repositories.enabled: It enables JPA repositories. The default value is true. spring.jpa.database: It targets database to operate on. By default embedded database is auto-detected. spring.jpa.database-platform: It is used to provide the name of database to operate on. By default it is auto- detected. spring.jpa.generate-ddl: It is used to initialize schema on startup. By default the value is false. spring.jpa.hibernate.ddl-auto: It is DDL mode used for embedded database. Default value is create-drop. spring.jpa.hibernate.naming.implicit-strategy: It is Hibernate 5 implicit naming strategy fully qualified name. spring.jpa.hibernate.naming.physical-strategy: It is Hibernate 5 physical naming strategy fully qualified name. spring.jpa.hibernate.use-new-id-generator-mappings: It is used for Hibernate IdentifierGenerator for AUTO, TABLE and SEQUENCE. spring.jpa.open-in-view: The default value is true. It binds a JPA EntityManager to the thread for the entire processing of the request. spring.jpa.properties. 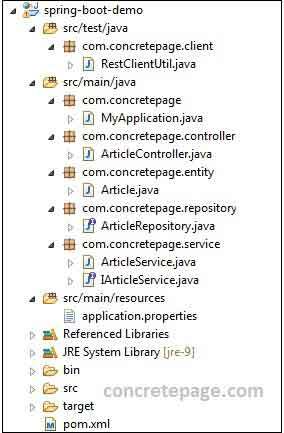 *: It sets additional native properties to set on the JPA provider. spring.jpa.show-sql: It enables logging of SQL statements. Default value is false. Find the project structure of our demo project. Find the MySQL database table used in our example. To test the application, first create table in MySQL as given in the example. Then we can run REST web service in following ways. 1. Using Eclipse: Download the project source code using the download link given at the end of article. Import the project into eclipse. Using command prompt, go to the root folder of the project and run. 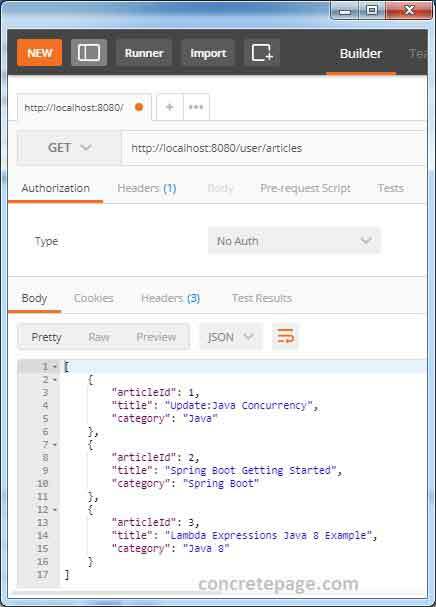 We can also test application using Postman. Find the print screen.